This is an appreciation card for one of my much-loved cousins who loves horses. For many years, her best friend was a huge and beautiful black horse called Duke and I know she misses him terribly. This is an easy card to make, as long as you work in the right order. Stamp the grass from the Enjoy Life stamp set. I used Call Me Clover ink. 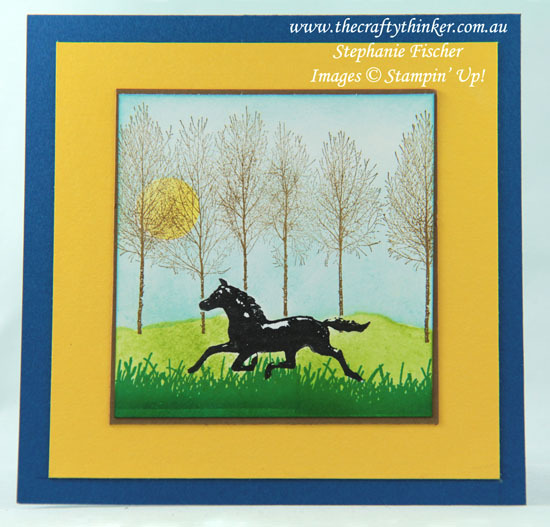 Use a Stampin' Write Marker (I used Basic Black) to ink only the horse in the weathervane image from the Country Road stamp set and stamp the horse. Make a mask by stamping the horse again on a piece of scrap paper or a Post It Note and cutting it out just inside the lines. Place the mask over the stamped horse. Tear a piece of scrap paper to form some hill shapes and place it so that the torn edge is facing down towards the grass. Sponge a lighter green between the stamped grass and the torn paper edge. Punch a small circle (keep the remaining piece with the hole as a stencil) and place as a mask in the sky area. Lightly sponge the sky (I used Balmy Blue). If you're concerned about sponging blue onto the grass area, you can mask the grass with the other piece of torn paper. Remove the mask from the sky. Place the punched hole over the white circle in the sky area and sponge lightly with yellow ink to create a sun (I used Pineapple Punch). Remove the stencil. Remove the mask from the horse. Change the colours to create a night sky, leaving the circle white for a moon. Add some stippled amber/gold foliage to the trees for an autumnal look.